Though disappointed by the weather conditions that resulted in the cancellation of Sunday’s community commemoration of the Shoah, we are blessed by the outpouring of support we received from our partners and participants. Even in the face of the hard choice to cancel our ceremony, we are reminded that this community is bonded together in commitment, passion, and strength. At the Yom HaShoah Community Commemoration we come together to remember, honor survivors, and affirm our community’s commitment to Holocaust memory. We demonstrate the value of l’dor v’dor – from generation to generation. 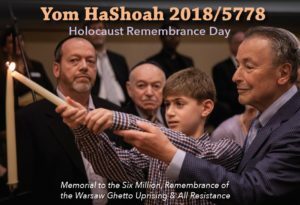 Though we were not able to gather together this year – we encourage you to find a personal moment to remember, to listen tot he words of a survivor, to remember the resistance, and to encourage and support the ongoing education of our future generations. This is a commitment for every day and not just for the day of our community commemoration. – Our keynote speaker for the day was Eric Blaustein. You can hear a few minutes of his experience here. – Other survivor testimonies can be viewed here. Remember the resistance. Here is information about the Warsaw Ghetto Uprising which took place 75 years ago. – Honor Holocaust educators. This year’s commemoration honors teacher Beth Feest who has shown a commitment to Holocaust education by teaching a quarter long Holocaust unit in her 20th Century History class at Christian Life School in Kenosha, Wisconsin for the past 17 years. A number of her students have won the Holocaust Essay Contest. – Learn about March of the Living which sends youth to learn about the Holocaust. This year marks 30 years since this endeavor was initiated and we must remain committed to these kinds of educational activities in the years to come. – Learn more about the Nathan and Esther Pelz Holocaust Education Resource Center which educates thousands of young people and teachers across the state of Wisconsin and provides numerous public programs about the Holocaust.